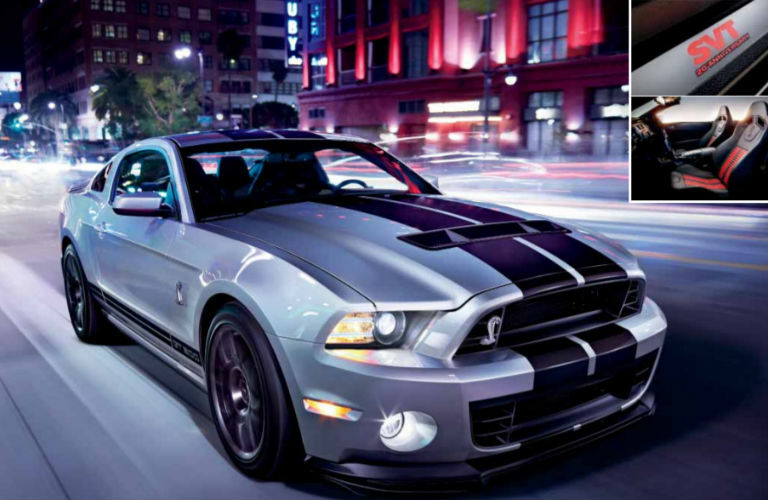 Words cannot even describe the feeling you get when you take a seat behind the wheel of a Ford Mustang Shelby® GT500®. If you’re looking for a sports car that can take your breath away every time you start the engine, the Ford Mustang Shelby® GT500® in Newport Beach, CA is the perfect car for you. Once you hear that rumble underneath the hood of this iconic muscle car, you’ll never want to drive another vehicle again. The Ford Mustang Shelby® GT500® receives a more powerful engine than the stock Mustang and it also offers some extra performance features that help deliver increased driving dynamics on the road and track. If you want to have fun behind wheel every time you take a seat, the Ford Mustang Shelby® GT500® will deliver. 2011 Ford Mustang Shelby® GT500® – The extremely powerful and high-performing engine that you’ll find underneath the hood of this iconic Mustang is a 5.4-liter, 32-valve, DOHC, supercharged and intercooled V8 that can put out an incredible 550 horsepower and 510 lb-ft of torque to the rear wheels. Performance features available include a 6-speed TREMEC® manual transmission, SVT aluminum wheels and Brembo™ disc brakes. 2013 Ford Mustang Shelby® GT500® – This is the model year where you’ll find a new and more powerful engine in the Ford Mustang Shelby® GT500®. Pop the hood open and revel at the 5.8-liter supercharged V8 that can send a heart-pounding 650 horsepower and 600 lb-ft of torque to the rear wheels through its standard six-speed TREMEC® manual transmission. Performance features available with this model include quad exhaust pipes, Brembo™ brakes, carbon-fiber driveshaft, Mustang Track Apps features and a race-tuned suspension.